Late one night, an Ithaca couple heard what they thought was a bird stuck in their roof. When they looked outside, they saw glinting eyes, and blamed the noise on a raccoon. 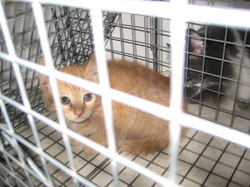 When morning rolled around, they saw an adorable orange kitten, but to their dismay, he wanted nothing to do with them. He ran and hid in tiny gaps in their roof that they had no way of getting to. Knowing that their neighbor had utilized Kristin to trap feral cats on their land, the couple also reached out to her for help. In less than 20 minutes, the hungry kitten was trapped and rescued from the roof. Robin lived in a foster home, where he learned how wonderful people can be. After being fixed, he went to live with friends of the couple that found him stranded.